Baptism, the first Sacrament of the church, initiates us into the Body of Christ … into His life, Death and His Resurrection. It is the essential sacrament in becoming a disciple of Christ and indelibly marks us as His. This sacrament is the essential prerequisite for all the others. As a Sacrament which joins the baptized to the Body of Christ, it is appropriate that it be celebrated in the presence of and with the participation of the members of the Body at mass when all are present to welcome the new member. Parents need to contact the parish to arrange for the baptism before they announce it to their families. 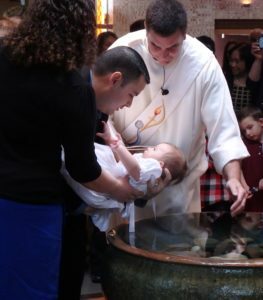 They may chose to have their child baptized at a Sunday mass or in the Afternoon on an available Saturday or Sunday. Baptism preparation sessions take place on Sundays (ordinarily the 1st Sunday of the month). The participating families will join the community for the 10:30 Mass followed by the session in the Devine Center. Childcare will be provided by our youth. Baptisms are usually celebrated twice a month, with one held on a Saturday and the other on a Sunday, at 1:30 in the afternoon. When the parents call the parish office to make arrangements for the Baptism, they are also scheduled for a Baptismal Preparation session. Generally, the families scheduled for a specific Baptismal date are also scheduled for the same Baptismal Preparation session. Please call the parish office at 708-429-6767 well in advance of the desired date for Baptism. If you are interested in becoming a Baptismal Preparation Facilitator, please contact Marianne Mueller at 708-439-6767 X213 or [email protected].